However great one maybe, the rules of Samsar (material laws) are like that - they apply to all. Examples of this can be seen even in the lives of great Maha-purushas and Siddha-purushas. For example, Ishwar Puri cleaned the urine and stool of Madhavendra Puri who was Mahaprabhu's Param Guru. This shows that Madhavendra Puri was ill. If such great souls can be afflicted with disease, then what is the fault if we suffer from disease? It is God's will. One should think: my karma phal (reaction of my past Karma) is good. Whatever has to happen, let it happen. I am not sad on that account. O Lord, whatever is my karma phal, give it to me- but You should be happy. I am prepared to go to hell or even to heaven- wherever my karma takes me. But I want You to be happy. You should be pleased. When a devotee suffers from disease, it is to be understood that God has given him the disease out of His mercy (Kripa). Do you understand? He shows to other people in the world that see he (say, a Baba or Sadhu) is also suffering from disease. But this kind of disease is out of God's mercy. Another kind of disease happens because of a person's karma phal. A Baba has no karma phal. Do you understand what karma phal means? If a person commits sins in his past life, then he has to suffer miseries (reactions) for them in this life. A Baba has no such sinful reactions. God wipes them all away. Then why does a Sadhu still suffer misery? Because God gives it out of His will. God gives it because of lokachar (social interaction): so that worldly people think that, 'see, a Sadhu also suffers from disease.' But they don't understand why it happens. They are not aware of the root cause. Such suffering is because of God's gift, not because of Karma. God gives it out of His (mercy) Kripa. God has nothing but Kripa to give. The disease (of a devotee) is also his Kripa. God has nothing else. He has only Kripa! So what can he give us? If he has only Kripa, then alright, give us Kripa. He does not curse, nor does He wish anybody ill. He has only Kripa. A person who understands this is able to cross over the material ocean. He doesn't regard his suffering as misery. He considers it as happiness, as God's gift. Unfortunately, not many people are fixed in such determination. Usually they say, 'O God what have you done?' And they rush to doctors, pay money, run about here and there. They dont understand. But a person who has attained knowledge understands that misery or disease is a gift of God. Why should I go to a doctor? 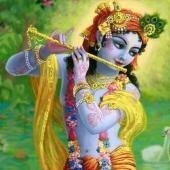 God has given it to me out of His mercy (Kripa). So let me accept it. God has given it, so let me eat. If He gives me something bitter to eat, I will eat that too. If He gives something sweet, I will also eat that. Therefore, a Sadhu tolerates everything in life.